ALTERNATE METHOD: Heat oven to 325°F. In 1 1/2-quart casserole or glass baking dish, mix green beans, soup and milk. Bake 25 to 30 minutes, topping with onions during last 5 minutes of baking, until bubbly. Get this veggie dish ready the day before. Store covered in your fridge until ready to bake. Add a few extra minutes of bake time because it will be cold when it goes in the oven. Any cream-style canned soup makes just the right sauce for the beans—celery or chicken are equally good. An additional dash of garlic or celery salt is a nice flavor booster. No French-fried onions? Sprinkle on crumbled cooked bacon or toasted sliced almonds, or serve topped with lots of sliced green onions. Frozen, French-style green beans are an easy swap for the canned beans in this recipe. You’ll need 2 (14.4 oz) bags. Thaw overnight in the refrigerator and drain before using. To be sure your baking dish holds 1 1/2 quarts (6 cups), use a liquid measuring cup to pour water into the dish till it’s full. You’ll want enough room so that the beans don’t completely fill the dish. Here’s how iconic classic green bean casserole is: The original recipe card is displayed in the National Inventors Hall of Fame in Akron, Ohio. It’s the side dish that transforms an everyday meal into a memory-making Thanksgiving dinner. Some estimates say that 40 percent of the cream of mushroom soup sold in the United States goes into making green bean casserole. 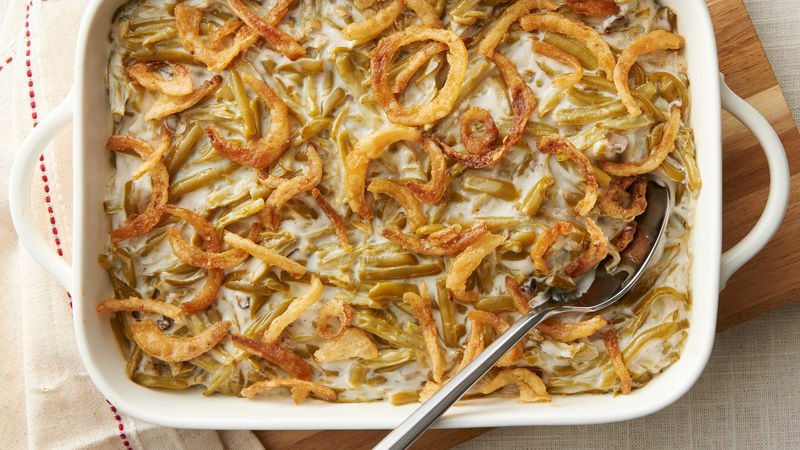 The popularity of green bean casserole just keeps growing, as a new generation discovers how easy it is to make and how delicious it can be. If making our best green bean casserole recipe inspires you to try more warm, comforting recipes, try another from our collection of top casserole and pot pies. You’ll love how easy these dishes will be to pull together, and you're sure to appreciate the timing-saving, make-ahead options. Even better, casseroles are always a good choice when you’re serving a large crowd.